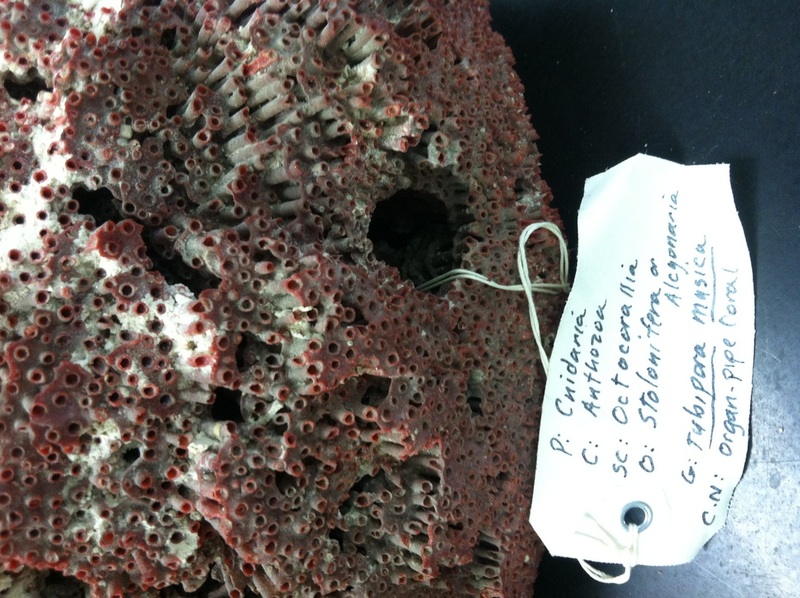 The organ pipe coral is unlike most corals due to the fact that it lacks colorful polyps, but has a dark red colored skeleton composed of thin tubes that look similar to a pipe organ. Colonies of organ pipe coral polyps can form mounds of up to 50cm in diameter. They also form symbiotic relationships with zooxanthellae to obtain nutritional benefits. In addition, the polyps of the organ pipe coral can use their tentacles to catch plankton and other small microorganisms that happen to float by. The organ pipe coral can be found in the shallow waters of the west Pacific to the south of Japan, west to Africa's east coast, and throughout the Red Sea. They prefer sheltered areas on reef slopes. The organ pipe coral is an important part of maintaining a balanced reef ecosystem that humans rely on for a number of reasons. It is currently considered near threatened on the IUCN Red List. "Organ pope coral". Arkive.org Retrieved from: http://www.arkive.org/organ-pipe-coral/tubipora-musica/.